I love this 1928 promotional advertisement for the movie Dirigible (see the ad larger here), citing William Wellman as producer and John Monk Saunders as writer and director (the two had worked together on the smash hit Wings — with Wellman the director and Saunders the screenwriter): Wings was the first recipient of the Best Picture Oscar and had a ton of heat, and Dirigible was supposed to be a follow-up of sorts. “1928 will be a dirigible year,” say the experts. The big ocean liners of the air will flash into the limelight as brilliantly as did Lindbergh in 1927. Paramount, ever first to sense box office, presents the first spectacular special with dirigibles as a thrilling background. Love the poster, too bad the movie was never made. I guess 1928 wasn’t a “dirigible year” after all. 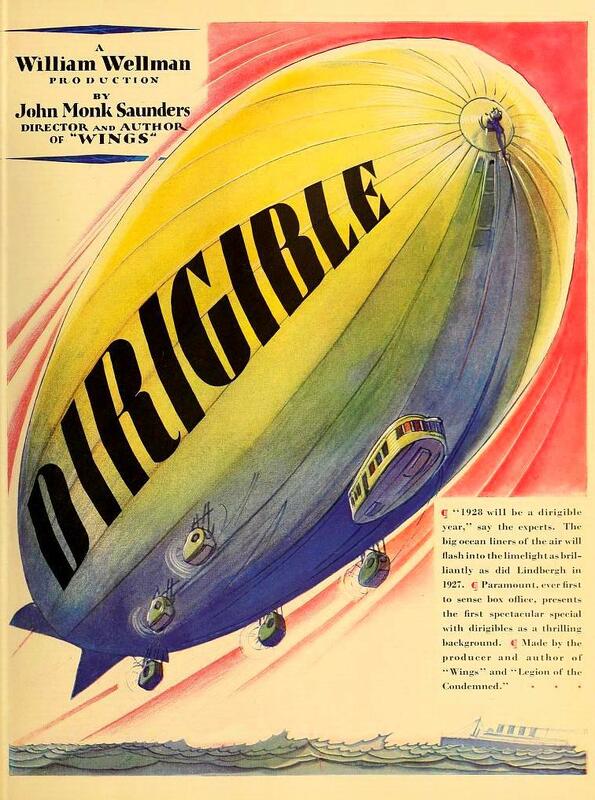 Oddly enough, though, there was a movie called Dirigible — but it was released three years later, in 1931. And it wasn’t released by Paramount. And it didn’t have the involvement of Wellman or Saunders. It did, however, star Saunders’ wife, Fay Wray. Promotional poster from a Paramount publicity spread of upcoming movies — it appeared in the trade magazine, Exhibitors Herald, in 1928. The 1931 film starring Fay Wray and Tim Holt and directed by Frank Capra is on YouTube in its entirety, here. This entry was posted in 1920s, Movie Posters, USA: Hollywood and tagged Dirigibles, Movie Posters. Bookmark the permalink.